Matthew Huron grew up in San Francisco’s gay Castro district, four doors down from neighborhood gay bar the Men’s Room (now called the Last Call Bar) on 18th Street. It was his dad’s “staple” hangout. In the 1990s Huron, who is straight, turned to cultivating cannabis as his dad and his dad’s partner both suffered from symptoms of HIV/AIDS. Sixteen years ago he started the Elmar Lins Compassion Co-Op, named after his father’s partner, to provide medical marijuana to hospices and assisted living facilities in the Bay Area. “My dad found therapeutic benefit through cannabis,” said Huron. Lins passed away in 2008, and after his father died the following year, Huron relocated his business to Denver, Colorado. In 2010 Huron, 42, opened his first Good Chemistry marijuana dispensary in the shadow of the state Capitol, an area of town that reminded him of San Francisco’s Mission District. 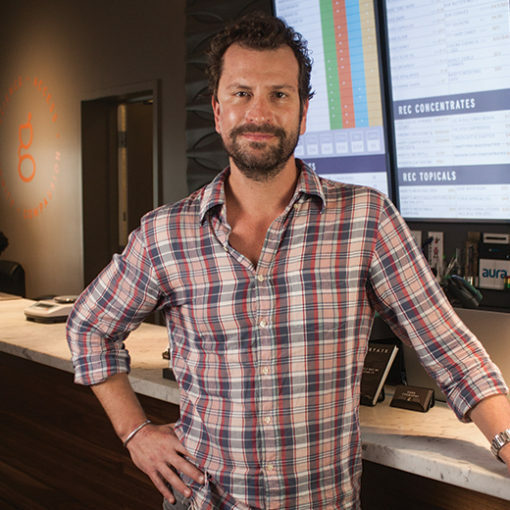 Today, he owns a growing marijuana dispensary and cultivation company that includes two dispensaries and several cultivation sites in the Mile High State. The company is now expanding into Nevada, opening a 5,000 square foot cultivation site this summer in Reno in a building capable of expanding to 12,000 square feet.